"Please help me finish The Peace Garden, and spread this anti-bullying message of peace and resilience around the world." Mauricio Sosa was bullied for much of his young life. When he reached Basalt High School, he knew he could either stay inside a shy and timid shell or take action. He chose the latter - and decided not only to help himself, but to create something special and enduring for kids like himself, seeking a nurturing environment and confident voice. In 2014, Mauricio got approval from the school administrators to transform an unused 40' x 73' grassy alcove of the Basalt High School into a public garden and meeting space. He raised $44,380, and the basic design and structure of the garden – with winding walkways, rocks, and planting – was completed in the spring of 2016. He called it "The Peace Garden” - a place of harmony and refuge for young men and women, and a focus for his “anti-bullying” message. Mauricio graduates in June, and the Peace Garden isn't finished. There's much to be done to ensure that the garden provides a fully-usable, inviting and sustainable space for future generations of students, families and visitors, and Mauricio is determined. And there's more. Mauricio plans to share his message beyond Basalt High School and the Roaring Fork Valley to wide-ranging communities and kids with fears and hesitant dreams of their own. As part of his senior Capstone Project, Mauricio will create an instructional manual, complete with budget, grant applications, and process summary, plus a project video (with the help of Emmy Award-winning videographer Barry Stevenson) to share on social media and via press releases around the country. The total estimated Phase II Project cost is $28,574. Through generous grants and in-kind commitments from the Eagle County Neighborhood Partnership Program, the Town of Basalt, Pitkin County, Holy Cross and CORE – plus in-kind support from Outside Adventure Media, R&A Enterprises (electric), Mountain Greenery, and others, Mauricio has already raised $18,772.75 of the Phase II budget. All that is needed is $10,421.25 to fulfill his dream and leave a lasting legacy. Building Community. 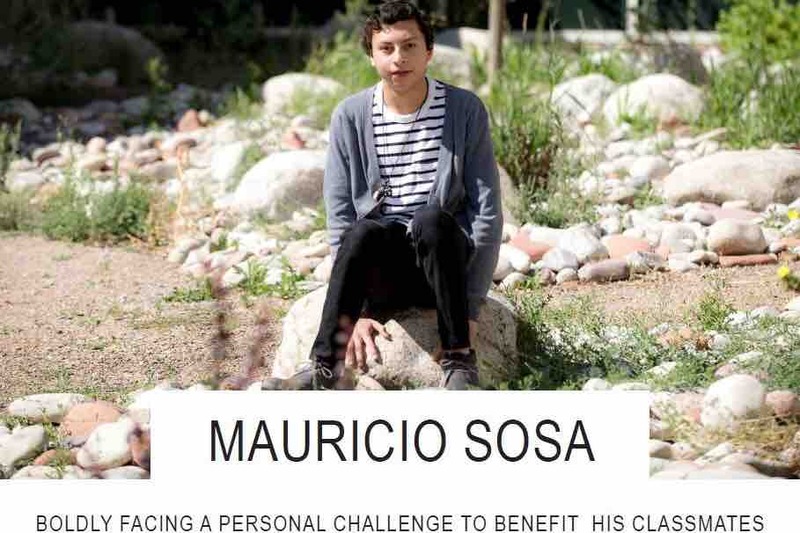 For a young man who once could not read a poem in public, Mauricio has done the unimaginable: he’s brought a community together and raised about $63,152 so far in grants, individual donations, and in-kind support and established a legacy for all to enjoy. Place Making. Once finished, the Peace Garden will provide a pacific setting for BHS students and visitors to sit quietly, converse with friends and hold classes in meditation, breathing and human interaction, along with other school functions. Beautification and Art. Located on the school's front-facing wall, the garden's lighting and design will be visible to all entering the school, attending events, and passing by along the Rio Grande Trail. Already, students are creating colorful "peace art," with messages on rocks around the garden. Sustainability. As much as possible, the principles of xeriscape landscaping are being applied at The Peace Garden. Drought-tolerant plants and pathways replace the former high-water-use grassy area, reducing watering, maintenance, and expense. Included in his Capstone product will be a long-term sustainability plan. Inspiration. Today, and in the future, the garden is a beacon of kindness and a monument to one young man’s determination to overcome mistreatment and intimidation. Amid final exams and college applications, Mauricio is doing whatever it takes to ensure its viability and longevity for future generations of young students. Will you join Mauricio in this effort? Imagine for a moment. Amid the tragedies of the day, the sad and troubling news, a whisper of hope. A community reaching out to offer this tangible tribute to peace and kindness. Think of the young people around the world Mauricio’s story might inspire. How many communities it can help unite in supporting the safety and well-being of our nation’s youth. Please help today by making your contribution of $10, $25, $100 or as much you wish to share. The participation of all is welcome, and no donation too small. For updates on Mauricio's progress and the spread of The Peace Garden, please click here to visit and like The Peace Garden page on Facebook. Eagle County Neighborhood Partnership Program, Town of Basalt, Pitkin County, CORE, Holy Cross Energy, 5Point Film Dream Project, Schuss Foundation, Snowmass Chapel, Roaring Fork Club, Aspen Elks, Aspen Out and the Aspen Thrift Store. R&A Enterprises (electric), Twisted Tree Landscaping Construction, Larson Trucking, Heyl, Pitkin County Landfill Grand Junction Pipe, Growing Empowerment, Mountain Greenery, United Sievers Pit, Express Carpet and Duct Cleaning, Robin Waters, Kate Bradley and Andrew Broadhurst who, through his own Capstone Program at Roaring Fork High School, is learning about and contributing the electrical installation. And a big hug to Jim and Dianne Light who have cared about and mentored Mauricio and other young students through the years. “The Peace Garden is a story of mental strength and survival. Mauricio is a radiant example of a young man who transformed his unfortunate experiences into something positive, a healing project for himself and a gift to others- a place for other young people making their way in the world to find solace and inspiration. The Peace Garden at Basalt High School stands as a symbol of hope and offers a model to schools and communities in Colorado and around the country. "I have mentored Mauricio Sosa, the student responsible for the garden, since its inception four years ago. It has been very rewarding to watch Mauricio's growth and commitment during this project. He began as a shy and understandably inexperienced high school student and has become a proactive and organized project manager. He is making his dream come true. It has been heartwarming to watch our community's support of Mauricio's project whether through donations or awards. Its creation has taken a village and has impacted so many, particularly our students." Please join me in celebrating The Peace Garden at Basalt High School and thanking all those who helped to make it possible. The event is open to the public. Bring your friends. Refreshments will be served and appetizers donated by Whole Foods. I leave soon for college and am working hard to finish The Peace Garden - for future students, families, visitors, and classes here in the Roaring Fork Valley. I am also putting together easy instructions, grant templates and a video for people around the country to use to create their own Peace Gardens. By the June 1 ribbon cutting ceremony, we are working to have the Garden’s paths and eco-water systems will have been upgraded, new plants in place, electrical pathway lights installed, and hopefully, a new, lighted sign. You'll have a chance to see a sketch showing where the Garden is heading. We hope to see shade structures and permanent seating in place this summer or early in the next school year. Please join me in celebrating and thanking all those who've contributed in so many ways. - Share our GoFundMe Campaign & encourage people to donate.